Number of cards in deck: Two identical decks of 24 cards each. Measurements: 3.45 x 2.95 inches; or 88 x 74 millimeters. Back of card: A golden sun face. On one deck, on a solid red background, on the other, on a solid blue. Not a tarot deck, so not for inversion. Book included: Yes, 224 pages, 5.85 x 8.15 inches, or 15 x 20.5 cm. Text by Liz Greene. There's also a largely blank workbook, perhaps 100 pages, to record your work, 4.75 x 5.8 inches, or 15 x 12 cm. Publisher: Fireside/Simon & Schuster. Printed in Hong Kong. Comments: Use this book, teach yourself rudiments of astrology. 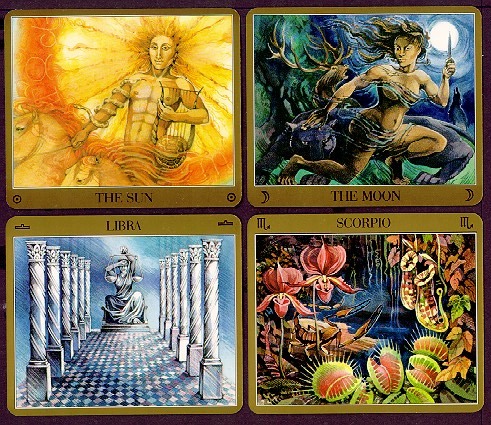 In each deck, there are cards for each of the planets, plus Chiron, as well as for each of the signs of the zodiac, and the ascendant. The book gives tables for finding your planetary positions, as well as a crude table for finding your ascendant. If you follow the instructions & get an ascendant that seems unlikely, try the signs on either side. There are two sets of cards, and room for two sets on the reading cloth (actual green/blue cloth, gold printing). This is so you can compare your planets to those of a friend.